The campaign is exciting but only passively entertaining, and the multiplayer tweaks the knobs of established Call of Duty games to little effect. I'm in space, I'm underwater, I'm piloting a dog, I'm piloting an Apache, I'm driving a tank that handles like a Lamborghini—all without ever really learning a new skill. The Apache, for instance, is magically repulsed from the ground—it's like piloting an air hockey disc—so finesse is unnecessary. On-screen cues tell you what you need to know as you're plunged into an airstrike: fire flares when an enemy locks on, left mouse button to fire your cannon, hold down the center mouse button to lock on with missiles. Then go to town. It's fun in that it's something exciting to see and do: a theme park ride where I'm given an airsoft rifle to pelt the animatronics with. And it's a brilliant ride. There are pyrotechnics, car chases, submarines, and drone strikes. Once scene has me rappelling down a skyscraper and shooting guards through the windows—and then the skyscraper collapses while I'm in it. It's every action scene Hollywood has imagined for the past 20 years packed into five to six hours of super-stylish interactive montages, and wrapped up in a goofy, inoffensive story about brothers trying to live up to their dad's super-soldier status. It's fun, but it's not engaging—Ghosts' campaign is even more passive than Telltale's recent point-and-clickers. In The Wolf Among Us, I have choices. In Ghosts, I do the Right Thing or fail. Frustratingly, even the decision to follow the constantly barked “keep moving” order can get me killed. That repeated flavor dialog should be ignored: save heroics for the scripted moments, stay crouched, and pop up sporadically to shoot at the bad guys. In rare instances, I was able to part from my squad, flank the enemy, and wipe them out with the advantage, but that kind of tactical planning was a sparsely present treat. It appeared once more in a jungle mission which put columns of guards between me and my squad, arming me only with a silenced pistol and sensor to detect nearby enemies. That was the only time I was given a goal and left to achieve it without explicit instructions for every action. That was also the only time I got a magic bad guy sensor, and that's another of the campaign's failings: it fires off interesting ideas and then instantly forgets about them. Near the beginning, I'm introduced to my canine companion, Riley, and I can mark targets for him to quietly de-jugular. I did that once, when ordered to, and never again. Later, I get to use a remote-controlled sniper rifle to clear out a stadium. It's a great gadget that I'd have liked to plop down on my own a few times, but it never shows up again. Both weapons are like toys that I get to demo in the store, but never get to take home. Sgt. Shark is awfully testy today. But we get bored of toys after we take them home, whereas if we stay in the toy store, poking at everything that requires batteries, nothing needs to do more than light up and make noise to keep us entertained. And you won't ever be bored, because Ghosts' novelties are brilliant and bright, full of life and then whisked away before they can be broken open and revealed to be little electronic tricks. 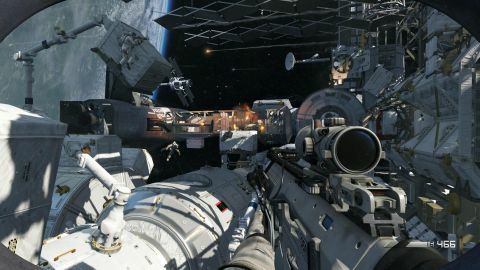 If you buy Ghosts just for the multiplayer, I will say that you should at least play the campaign long enough to get to the first obligatory space scene. It's fantastic. It's Gravity with guns. I wish the whole thing had been in space. The multiplayer is more Call of Duty® Multiplayer. It's about flanking, out flanking, and milliseconds of animation that determine who lives and who dies. The maps are circular arenas dressed in gray military garb, pulling assets from the dullest bits of the campaign's setting. Instead of a space station and tropical shipwreck, the maps are Busted Up Train Yard and Overcast Snowy Place. In most modes, death nearly always comes from behind or upon rounding a corner and shooting too slowly to avoid a knife to the gut. There's no front line, so every kill is likely to instaspawn your foe somewhere behind you, making matches a dizzying circular chase sequence. Getting knifed from around a corner is something I excel at. Guns are plentiful and nuanced, though every vital stat, from how long it takes to raise the iron sights to recoil and spread, is experienced in milliseconds of surprise action. Everyone swirls around the map like disoriented flies, and I either catch glimpses of their feet under collapsed steel girders, or run face first into them as our beelines intersect, reacting with spasms more often than cool tactical awareness. At pub levels, Ghosts' multiplayer is whack-a-mole to Counter-Strike's chess game. An exception is Search and Rescue, which gives teams bomb and defend objectives, and players one life per round unless a team member collects their dog tag to revive them. That encourages teammates to stick together, generating group engagements at range that I heavily prefer over darting around like an armed insect. I also enjoy, as I have in past CoDs, the Ground War mode. With bigger maps and 12-14 players, there's more room to breathe and more teammates to rely on during firefights. It's in that mode that I discovered that going prone is practically an invisibility cloak. I was able to camp out by a capture point picking off enemy after enemy for nearly an entire round, often after they ran right over me. It was fun target practice for me, but probably a frustration for the other team, which eventually had to run around the perimeter until it found a back to knife. Even in the modes I enjoy, I don't want to stay for long. The “one more round” syndrome just isn't present for me in Ghosts. In previous CoDs, the drive to unlock and try out a new weapon might have kept me going, but that's been replaced with Squad Points. Accrued through good play, the points can be spent to unlock any weapon at any time if you save them up. I appreciate that this is more respectful of players' time, as well as returning CoD fans' desire to get right to the gun they're happy with, but it nullifies any sense of accomplishment the progression system once had. Defending a point is easy when lying down makes you invisible. But it isn't just the progression system, or the complex-to-the-point-of-silliness soldier customization, or the boring killstreak rewards that make me tire so quickly of Ghosts multiplayer. It's that, like the campaign, it's about constant forward momentum, but unlike the campaign, it never changes. The matches go by too fast to ever develop a rhythm or personality. From one map to the next, it's run, run, run. There are no nail-biters, no heroics, and no rivalries. There are no brilliant shots that I want to run to show YouTube, unless it's an accidental trick grenade throw. There are no moments when I pull back from my display, rub my forehead, and say, “I can't believe I did that.” Moments like that happen all the time for me in Unreal Tournament 2K4, Tribes: Ascend, Battlefield 4, Rising Storm, and earlier Call of Duty games. Ghosts multiplayer is a game of snap decisions, mechanics, and mistakes—"should have gone prone instead of firing, shouldn't have reloaded after that last kill, should have turned around instead of sprinting"—and it is freakishly nuanced and can absolutely be mastered. I respect those with the drive to master it, but it's too bleak and severe for my tastes, and feels like preparing for ritual combat more than enjoying a game. The aliens eat sunsets. Give us your sunsets! That doesn't damn Ghosts as an icky console port, because my experience was otherwise well-optimized for medium to high-end PCs. I ran it fine on a mid-range build, and on a silly-powerful machine (Core i7-4950X, 16GB RAM, and two GTX Titans) the campaign ran at a silky and gorgeous 100-plus frames-per-second, with water and lighting effects that made me stop to gawk a few times (when I was allowed to). The only technical problem I encountered was sudden framerate dips in the menus, which are a just a nuisance—the same never happened to me while playing. The netcode in multiplayer is as robust as usual, but not better than previous CoD games. There were still a few times where I swear a hit registered on me before I saw my opponent's character model round a corner. These details have become a part of serious CoD play—some complain, but others master the nuances to gain an advantage. I'm not in either camp: I'm only bothered when synchronization issues cause frustration or feel unfair, and so far they've been too slight and sporadic to bother me. In multiplayer, you have about 30 frames in which to shoot first. What does bother me is how tired and cold Ghosts feels. I didn't touch on the campaign's story much, but its attempts to tug heart strings are cringe-ably cheesy, and the multiplayer seems bored of itself, changing systems just so they'll be different from Modern Warfare.